This puck has been personally dual-signed by NHL All-Stars, Sidney Crosby and Evgeni Malkin. Crosby was drafted first overall in the 2005 NHL Entry Draft. Crosby started strong out of the gates for the Penguins, scoring 39 goals with 63 assists. Crosby was deadly on the Penguins power play unit, tallying 47 points. Malkin was drafted second overall in 2004 behind Alex Ovechkin. Malkin played two more seasons in Russia prior to making his NHL debut. Malkin went on a tear to start his career scoring a goal in his first six games in the NHL, a modern-day record. Malkin won the Calder Memorial Trophy in his rookie season, following a season with 33 goals and 85 points. Crosby and Malkin led the Penguins to their first playoff appearance after four years of falling short. This NHL and NHLPA licensed product comes with a Frameworth COA and hologram to ensure the authenticity of the signature. 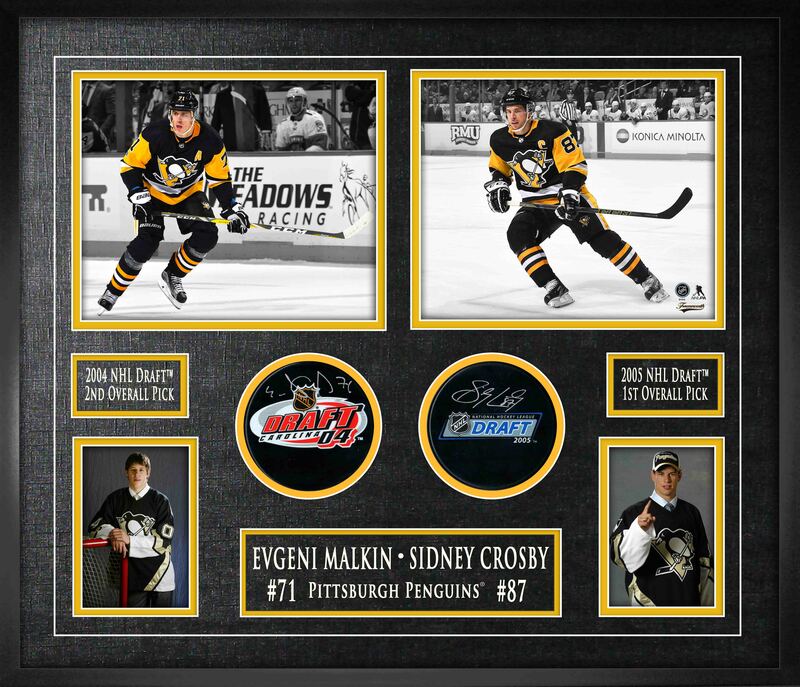 Frameworth is the exclusive provider of Sidney Crosby and Evgeni Malkin signed memorabilia. Approx finished size: 22x25”.